Given his audience, you could argue that calling attention to the 6 million people without health insurance in the state he governed for 14 years was more like a boast, but New Hampshirites would have been disappointed by anyone who traveled all the way from the Lone Star State to say things weren’t so hot in Abilene. Perry’s statement was not a gaffe, but you could say it was a neat example of an invisible synecdoche. A synecdoche is a figure of speech in which part of something stands for the whole—as in saying “Washington” to refer to the entire federal government, or saying “Jimmy Fallon” came up with a good joke last night instead of naming all his writers. Perry’s synecdoche was more discreet. When he said “Texans wanted” a large number of uninsured neighbors, he did not mean all Texans, or a majority of Texans. After all, the state never had a ballot question on whether to set up a health-insurance exchange under the ACA (Texas did not) or whether to expand Medicaid with the federal government picking up 90 percent of the cost (Texas said no thanks). It’s true that Perry and a lot of other people won elections in Texas by saying that Obamacare is terrible, but they predicted that people would lose insurance under the law. When Perry says, “Texans wanted” a large number of uninsured, he doesn’t really mean “Texans,” he means the political leadership in the state, which amounts to the Republicans in control of the governorship and the Legislature and the donors to their campaigns. 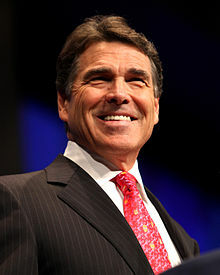 This would be a very long synecdoche, so Perry has simplified it to “Texans.” In print, he could use (Texans) or ¡Texans! to mean the elite who speak for all Texans, but that wouldn’t work very well in a stump speech. Using air quotes is considered effete for a man of the people; adding other punctuation hand gestures is out of the question. This invisible synecdoche is not limited to the Republican Party. Democrats are constantly saying that “Americans” want this or won’t stand for that when they’re really referring to teachers’ unions. They say that “Americans” want action on climate change when they know that only a handful of Americans have any idea of what that action would be and even fewer would support it. So Perry was following American tradition in that boardroom in New Hampshire, and his comment would meet hearty approval from our Founding Fathers, and by “Founding Fathers,” I mean Charles Pinckney of South Carolina. We can expect many more such synecdoches in the upcoming presidential campaign, and John Q. Public wouldn’t have it any other way.